When you’re over 50, working out can easily lead to injury. So, avoid the worst exercises for seniors and try lighter versions instead. Age might be just a number, but not when it comes to fitness and working out. The older you are, the more prone to injuries and complications your body is. So even though some might be in top shape at the age of 50, they’re definitely not spared from any health issue and injury. Below are the most dangerous exercises for seniors, including one trending workout that can lead to fatal complications if you’re over 50. 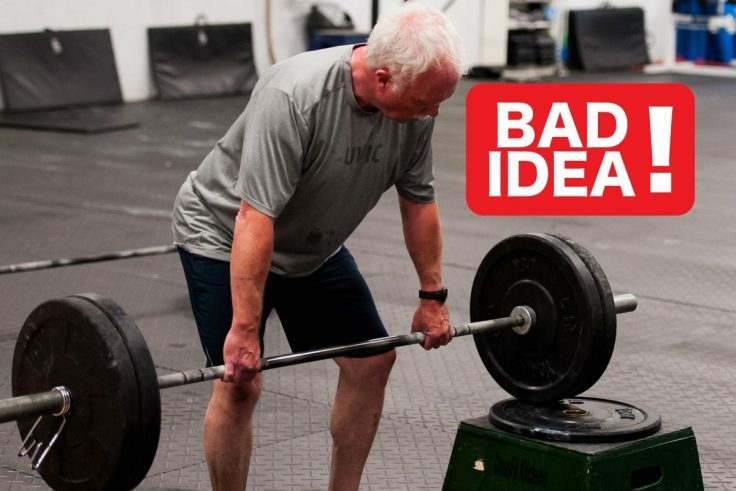 If you’re over 50 you don’t want to do any of these workouts. They’re the worse exercises for seniors and elderly people. So instead of putting your health into danger, try the exercises suggested for each workout. Running is one of the easiest, inexpensive, and best cardiovascular exercises anyone can do. But when it comes to long-distance running, you should definitely avoid it if you’re over 50. Don’t get me wrong, you shouldn’t stop running; just don’t run long distances and opt for short, manageable races. Better alternative: Introduce intervals of brisk walking in between short intervals of running at a moderate pace. So you’ve just watched Rocky and finally got the motivation to run up and down stairs. Well, congratulations! But before you start your Rocky Balboa style training, let me tell you that this is a bad exercise for seniors. You see, when you’re over 50, you can easily lose your balance. What this means is that you might lose your footing and fall down the stairs. Another reason to avoid running stars is its high impact on your knees. There’s just too much pressure on your joints when you run up and down. Better alternative: If you want to get similar results, minus bad joints, then use a stationary stair-climber at the gym. It’s a much lower impact alternative to running stairs. Squats are a wonderful way to build up strength and balance. But when you add weights to it, and you’re over 50, things can get dangerous. Squatting with weights puts too much pressure on your joints, making it one of the worst exercises for seniors. Better alternative: Do regular squats, without any added weight, and focus on proper form. Even though the overhead press exercise seems harmless, you should know that it can lead to serious shoulder and back injuries, especially when you’re over 50. That’s because your back mobility decreases with age and your muscles shrink as you get older. So there will be huge pressure on your back and shoulders. Better alternative: Try low-intensity shoulder exercises such as shoulder raises. This exercise can be a great muscle building move when it is performed properly. But for seniors, it’s one of the worst exercises they can perform. Doing bench presses the wrong way can have dangerous effects on your wrists, shoulders and pectoral muscles. So you have to keep in mind that, as you get older, your joints can’t handle much weight and this can lead to injuries. Better alternative: Skip the bench press and to a free weight chest exercise. Yoga is always a great choice to maintain flexibility, but the Bikram yoga can be the wrong option as you get older. You can dehydrate more easily as you get older so it may be a great idea to avoid the hot yoga studio that can get steamy. The dehydration and excessive sweating can lead to fainting. Better alternative: The best thing for you to do is to choose a low impact yoga class to maintain your flexibility. Doing crunches is not that easy, so if you’re over 50 you should avoid performing this move. Losing mobility in your spine is something that comes with old age. So you can also put your back and neck through serious muscle pains and pinch nerves. Better alternative: To make sure you are not putting to much pressure on your spine when doing your ab routine, do planks instead. HIIT exercises are definitely not for elderly people. Doing a HIIT session at the gym can make you seriously sweat and as you get older your body will dehydrate more easily. Dehydration can have side effects like dizziness, headaches, and lower blood pressure. So skipping the HIIT exercises is what you need to do. Better alternative: You need to make sure you have a lower impact circuit training routine. Everybody loves riding that stationary bike to burn off some extra calories, but you may wanna think again as you get older. Doctors found cases of patients, all spin class devoted, diagnosed with rhabdomyolysis. This is a potentially fatal syndrome usually found in victims of car accidents. But when the diagnose is directly related to spinning it can injure the muscles which can leak their content into your bloodstream. Rhabdomyolysis is a rare condition that overworks your kidneys and can cause deadly complications such as cardiac arrest and renal failure. Better alternative: Switch up that intense spinning class with a more moderate and less exhausting bike session. Even if you are doing deadlifts for years you can experience back pain! So as you get older your spine will decrease and this means that you should avoid those weights and forget about doing deadlifts at all. Better alternative: Lightweight dumbbell deadlifts. If you have hip problems and knee pains this exercise will just make that even worse. We all know that joint problems are something that comes with older age so avoiding the leg press machine at the gym is what you need to do. Better alternative: If you don’t what to skip leg day, try to do some low impact lunges instead of working on the leg press machine. If you have over 50 you should avoid using this machine because you can put too much pressure on your shoulders and neck and this can put you at risk for pinched nerves and rotator cuff tears. Better alternative: For your arm workout, you can do free weights lateral pull-downs with arms in front of you. This core exercise is a great resistance training and a cardio combo that will make you sweat and get your heart rate up. But if you are older you should try another type of abdominal workout, because, with this exercise, you can put unnecessary force on your wrists and shoulders. It is also a bad choice of exercise if you have knee pain. Better alternative: Try different plank variations that are more static and easier to do. This exercise is great if you want to achieve those perfect abs but your back can be the cost of it. With old age came a lack of back mobility which makes the twisting motion of this exercise very dangerous. It can cause major back pain which will make it harder for you to do other exercises. Better alternative: A great option for getting your ab workout done is doing standing abs moves or a usual plank. This is a great exercise and it can be practiced at any age. But if you are over 50 you should make sure that your boxing sessions are not too intense. Better alternative: Use a speed bag that will make it easier to stay balanced and you will be more stationary while boxing. Hopefully, these 15 alternatives for the worst exercises for seniors will help you get in shape without any pain, at any age. Also, if you need even easier alternatives for your workouts, you should opt for these chair exercises for seniors. They go easy on your back and knees, so why not giving them a try? Anyway, exercise is important for everyone, at any age. So getting older shouldn’t be an excuse to avoid working out. Instead, it should be a motivation to maintain yourself in your best form even though you’re over 50. Whether you’re doing these alternatives to the worst exercises for adults, or you’re doing chair exercises, or just brisk walk a half an hour a day, continue what you’re doing. Any kind of physical activity is better than no activity.